On January 10, 2017, Starbucks launched new food and drink in the stores. The Cascara Latte had its official launch (though it was soft launched on January 6th). So what’s new in stores? 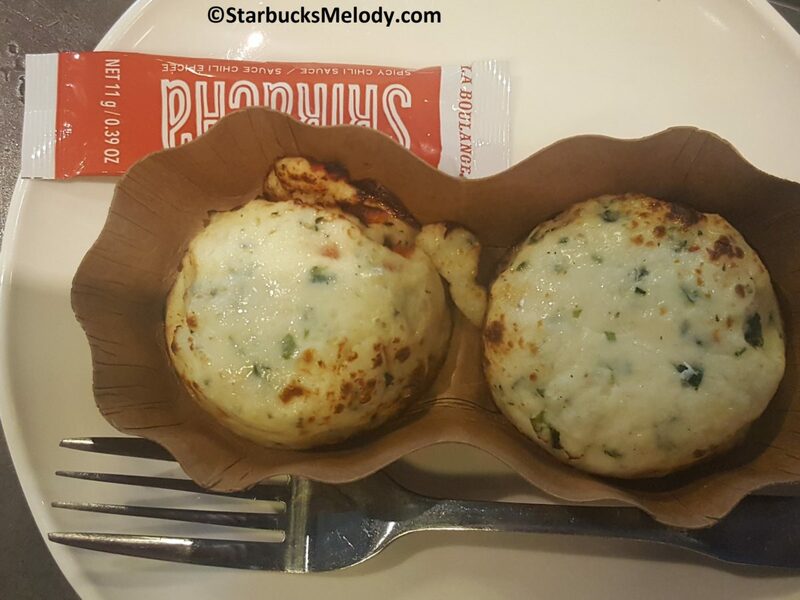 Breakfast at Starbucks gets delicious Sous Vide Egg Bites:. 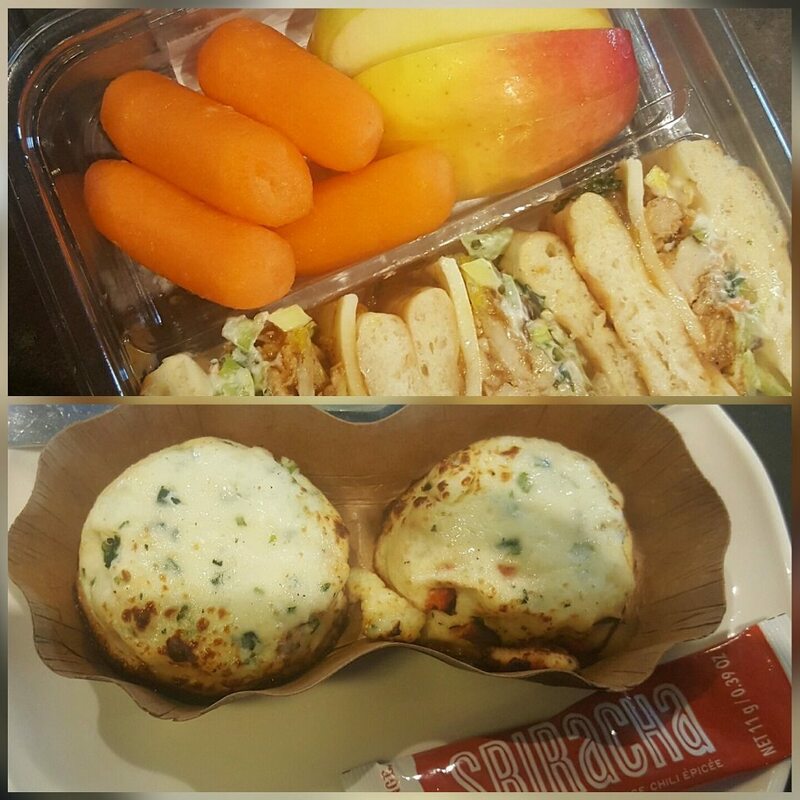 The Egg White & Red Pepper Egg Bites are only 130 calories. It is so nice to have a low calorie, low carb, delicious breakfast option. I almost with the Roastery sold these. For a little extra kick, ask for a packet of sriracha to finish off your egg bites. There is also the Bacon and Egg Sous Vide Egg Bites. My pick between the two is definitely the Egg White & Red Pepper. Somehow I found myself quite intrigued by these thermoses. 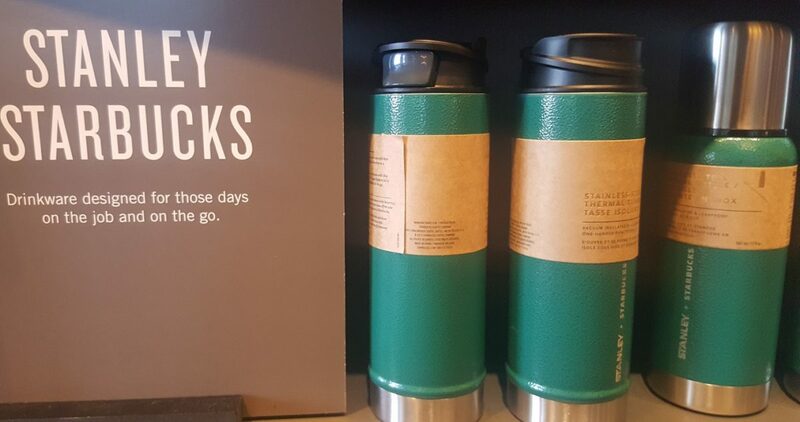 The Stanley Starbucks thermos only holds only 17 ounces, but it is sure to keep your coffee for quite a while. Make sure your local baristas are only charging you for a Grande size brewed coffee. I had to get one for myself, even though I don’t myself getting a lot of use out of it. What a great partnership though. There has to be room for some more unique Stanley and Starbucks partnered merchandise in the future. 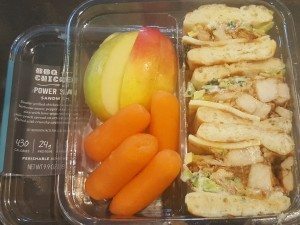 Lunch gets a new bistro box lunch option. It is the BBQ Chicken Power Slaw Bistro Box. The BBQ sauce makes the sandwich a tasty lunch. There’s nothing boring about this one. And it comes with carrots and apples on the side. I love both carrots and apples and it makes me feel a little less guilty about the carbs in the bread. But seriously, this is a delicious quick lunch option. Don’t forget that you can use your StarbucksRewards on food items. It’s a great way to try something new that you’ve been meaning to try. By the way, if you pick out two or three items and want to use a Starbucks Reward on a bistro box, your local register barista doesn’t even have to get it right for you to effectively use your reward. If you pick out a bag of chips, a bistro box, and order an iced Teavana Passion Tea, no matter which of these items your register barista selects for rewards, the register will automatically give you the * highest * priced eligible item off as a reward. This is a fairly recent change to the registers. All this really means is that it is even easier now use your Starbucks Rewards on food. The Sowden Softbrew is back at many stores. I love my Sowden Softbrew. It makes it so easy to make great coffee at home. I think I use mine just about daily. 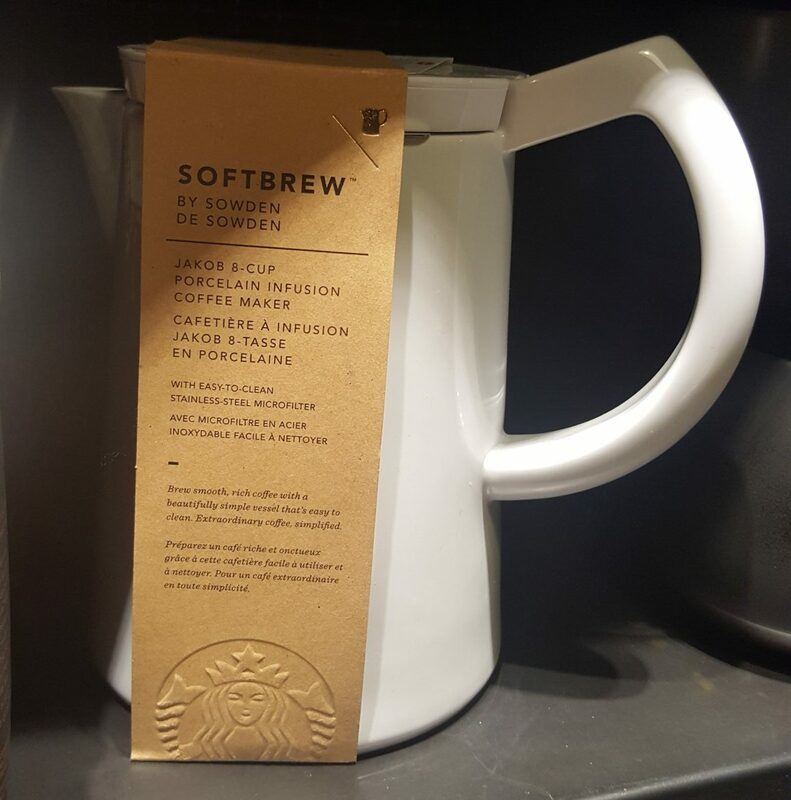 The Sowden Softbrew initially launched inside Starbucks stores about one year ago. They sold out, and stores were depleted until this recent re-launch of them. The great thing about the Sowden Softbrew is that you get a perfect cup of coffee with a lot of flavor akin to a coffee press (which is also an immersion brew technique). You’ll get a little less sediment than with a coffee press because of the special Sowden metal filter. The other thing is that Sowden boasts that you can be imprecise with your grind and still get a great cup of coffee. For the Sowden Softbrew, ideally you should use a coarse grind. However, I have tried using other grinds and it does seem that you get away with a little more flexibility in your grind due to the magic of the metallic filter. You don’t have to have a special pour technique like with a pour over brew method. You can worry a little less whether you ground your coffee correctly. And your clean up is a little easier than with a coffee press. The Sowden Softbrew is a super easy way to make a great tasting cup of coffee at home, akin to the flavor profile of a coffee press, but better. 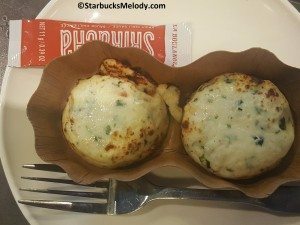 What’s your favorite of the new things at Starbucks right now? I definitely am impressed with the two newest things at my local store, the Cascara Latte and the Clover X brewing system. The Cascara is a welcome change from almost every other specialty Starbucks espresso drink which can often be described as liquid candy. I fully expected more of the same when I ordered my first one, and was surprised to notice it was half as sweet as I expected. You didn’t have sugar/maple/caramel/honey/molasses/pumpkin spice/peppermint/eggnog obliterating the taste of the espresso. Cascara Latte tastes like a latte, not a sugar bomb. The Clover X, all I can say is wow. Not that the traditionally drip-brewed coffees were bad (they are not) but this is a game-changer as I predicted when Melody first announced it. My local store (in Pickering, Ontario) is one of just 50 in Canada to get it this early (according to one of the baristas there), so this is even rarer than Starbucks Reserve! When I commented that my dark roast (Gold Coast blend) was much stronger than they used to brew it, the barista mentioned that the system still needs some tweaking, and that some customers complained that Blonde Roast comes out watery. I never order blonde so I can’t verify this, but thought I should pass that warning along – until this is fixed, might want to stick with dark or medium roasts when ordering “Brew Revolution”. Also worth noting, the Clover X did NOT come with a price increase — tall is still $1.90 Canadian at my local store. 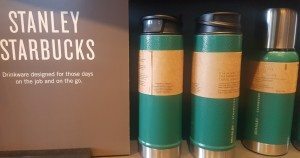 Comment on the new Stanley line, so far none of those are unique to Starbucks, you can go to Amazon.com and order identical models of insulated mugs/presses/flasks without the Starbucks logo on them (but still painted green) for about half the price. My current portable French press (a clear plastic Bodum one) is showing its age so I am considering the 16 ounce Stanley to replace it. Tex – I’m totally happy for you that you got the Clover X at your local store. I want one of those sleeves! The baristas in Pickering this morning mentioned how thrilled they were to get a comment from you! I really like the Sowden brewer! I’ve been doing a full pot of cold brew just about every day (doing just slightly more than the 2 Tbsp to 6 oz water ratio – I like it strong). It’s great straight black – nice & smooth, but I do prefer adding some half ‘n’ half, and that’s heavenly! Put the yolks back into the egg products!! Why are they still doing this egg white scam after the cholesterol/ saturated fat theory has been thrown out into the trash heap? Whole foods and whole eggs are how they were designed to be eaten. They have been beating this foolish egg white drum since they converted that truly awesome egg and cheese frittata years ago into an egg white and cheese and utterly destroyed it.